The final challenge for Designer Apprentice closed yesterday, and my submission was posted just under the wire. We had to choose one of our paper packs from earlier challenges (one of which I haven't posted here, oops!) and create coordinating elements. 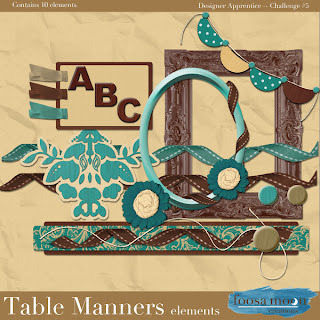 I chose to coordinate with Table Manners, and create a fairly generic set of elements to go with the papers. The elements <links have expired>. These links will be free for approximately two weeks before I will take them down. Thanks for all the support during this challenge season. I will keep this blog updated with new information and products as they become available. I am not selling in any shops at the moment, but hope to change that in the future! I am also on Facebook A LOT. Thank you so much for this post. I want to let you know that I posted a link to your blog in CBH Digital Scrapbooking Freebies, under the Page 2 post on Sep. 05, 2011. Thanks again. What a sweet kit! Thank you so much. i especially like the banner and the sticker, but the whole kit is a beauty.